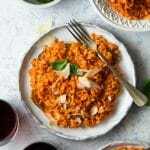 Super easy, creamy and comforting Tomato Risotto made with simple pantry ingredients and ready in only 30 minutes. This risotto is the easiest way to get comfort food on your table throughout the week. In a large deep saucepan under a medium heat add 2 tsp of olive oil and sauté the onion for 2-3 minutes. Meanwhile cut your courgette in half lengthways then cut into slices. Add the courgette to the pan and fry for 1 minute. Add the rice and garlic and stir to stop it sticking just for a few seconds. Add a few ladles of chicken stock and continue to stir until the rice starts to absorb the stock. Add the tomato paste and continue adding the stock a ladle at a time, allowing the rice to absorb the stock each time whilst constantly stirring. When there are just a couple ladles of stock left add the mascarpone, salt, and pepper to taste, then the remaining ladles of stock as before and stir until it reaches a nice creamy consistency but not too sticky. Add the parmesan, stir and serve. Make sure to saute the onion until soft as it will release a lot of flavour. Always add the stock a ladleful at a time allowing the rice to absorb the liquid in between. This helps create a creamy, silky texture as the rice absorbs all the flavours. If you add all the stock at once the rice will just boil and not be as tasty or creamy. Stir often, you don't need to constantly stir in fact when I lived in Italy I learned that stirring constantly releases too much starch and makes the rice sticky. Just look after it, don't let it stick and stir it after adding stock. Season - the amount of seasoning will depend on the stock that you use so always taste and add a little salt at a time.